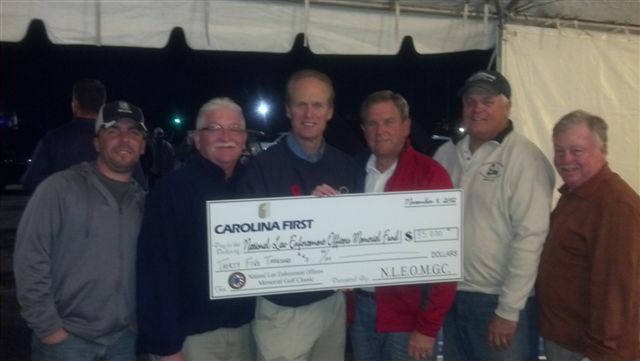 Last week at Legends Resort in Myrtle Beach, SC, the 13th Annual National Law Enforcement Officers Memorial Fund Golf Classic raised $35,000 for the Memorial Fund. Dubbed the "WORLD'S LARGEST LAW ENFORCEMENT GOLF EVENT,” golfers enjoyed five days of competition. The record $35,000 donation brings the total amount of funds raised from the event to over $500,000. The overall top male and female winners at this year’s event were Adam Argenbright and Vicki Dawson. Special thanks to event organizer, Dan Morphet, whose hard work makes this event possible. Also, thanks go to DynCorp International for serving as top sponsor. Today, at exactly 11 am, a color guard, made up of members from each of the military services, will stand watch during the annual Veteran’s Day ceremony at the Tomb of the Unknowns in Arlington National Cemetery. Just a few miles away stands the National Law Enforcement Officers Memorial, the national monument to law enforcement officers killed in the line of duty—including military police officers. 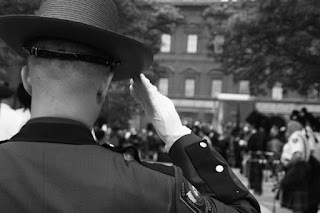 The parallels drawn between military and law enforcement service are vast and the line between them is often blurred. Both are fighting a war—with our military fighting overseas and our law enforcement often fighting the war on crime domestically. Both professions require courage and bravery—and breed American heroes. Many veterans turn to policing when they come home. Many law enforcement officers are military reservists. When it comes to helping others in need and securing cherished freedoms, the location of the war or the type of service is not what’s important to our men and women in uniform. This Veteran's Day, leave a tribute to recognize all the heroic and selfless contributions military and law enforcement officers make each day to protect our country and ensure our freedom. As long as these men and women are willing to put their lives at risk for our country, there is indeed great hope for our future. The National Law Enforcement Officers Memorial Fund enjoys the support of a special group of volunteers: Law Enforcement Ambassadors and Guardians. Law Enforcement Ambassadors are active and retired law enforcement officers from city, state, federal and military law enforcement agencies, while Law Enforcement Guardians are volunteers who support and honor law enforcement but are not sworn officers, allowing citizens, family members and corporate supporters to work closely with the Memorial Fund in achieving our goals. This month we spotlight an old friend who is more than just a member of the Museum’s National Honorary Campaign Committee. He is someone who truly admires and respects the men and women who serve our communities every day. All the Law & Order fans out there probably know him as Detective John Munch, the fictional character who has appeared on more episodes of a television show than any other police character throughout history. But Richard Belzer is also a true friend and supporter of the men and women who serve as public safety officials. For over 10 years, Richard has supported the Memorial Fund, participating in our events and even speaking on Capitol Hill in support of officer safety. This year, Richard once again emceed the National Law Enforcement Museum Gala on October 12. Though most are familiar with his acting career, some people don’t know that Richard is also an author. His past books include How to be a Stand-up Comic, I am Not a Psychic!, and of course, I am Not a Cop!. His latest book, Dead Wrong: Straight Facts on the Country's Most Controversial Cover-Ups, is now available at bookstores and online. If you know anything about Richard Belzer, then you know he loves a great conspiracy. His latest work is an entertaining read that claims to provide facts on many reported cover-ups. We will let you be the judge. 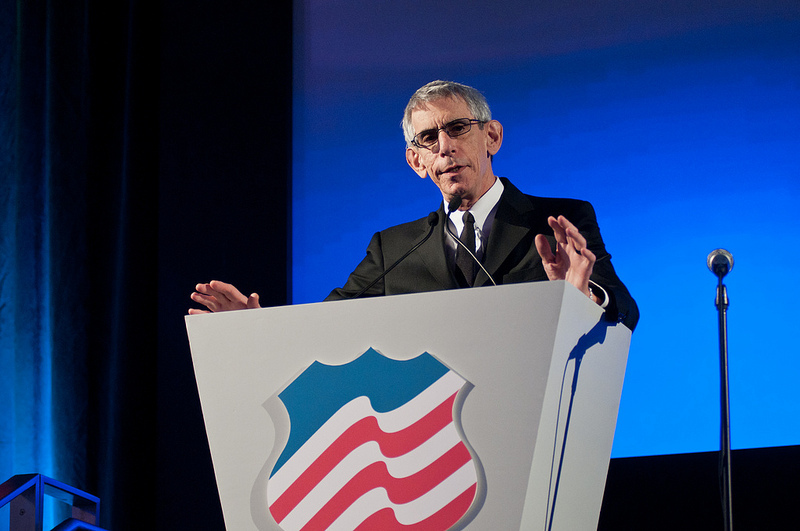 Please join us in thanking Richard Belzer for being a loyal friend and supporter of law enforcement! We are honored to be able to work with him and appreciate him taking time from his busy schedule to be with us. To learn more about Richard Belzer, visit his website: www.ibelz.com.